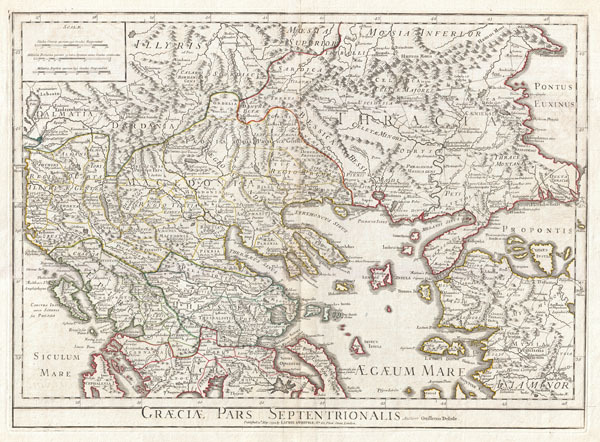 A large and dramatic Delisle map of the northern Greece, the Balkans, and Macedonia. Covers from Dalmatia east to the Black Sea (Pontus Euxinus) and south as far as Achaia, Cyprus, and Asia Minor. Includes much of the Aegean Sea and parts of the Adriatic Sea. Identifies various important locals from antiquity including the Hellespont, Byzantium (Constantinople or Istanbul), Troy, Macedonia, etc. Details mountains, rivers, cities, roadways, and lakes with political divisions highlighted in outline color. Title area below map proper. Includes three distance scales, top left, referencing various measurement systems common in antiquity. Text in Latin. Drawn by G. Delisle and published in 1794 by Laurie and Whittle, London.